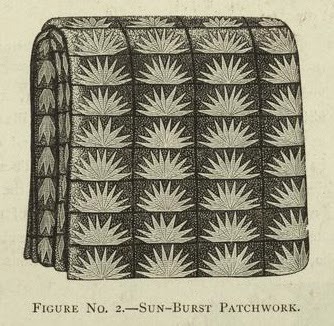 In the last post I wrote about the consensus among quilt pattern historians that the name New York Beauty was a commercial pattern name originating with the Mountain Mist company in the early 1930s, rather than the vernacular name given it by the quilters who actually stitched the design in the 19th century. And our surprise to hear from Vicki Betts that she'd found an 1854 reference to New York Beauty in a woman's diary. By putting in she meant she was putting the basted top in the frame. Apparently we are going to have to rethink our thoughts on the topic. New York Beauty was among the vernacular names used for the pattern above in the nineteenth century. But Merikay warns me to be skeptical. There are still many variables in this equation. 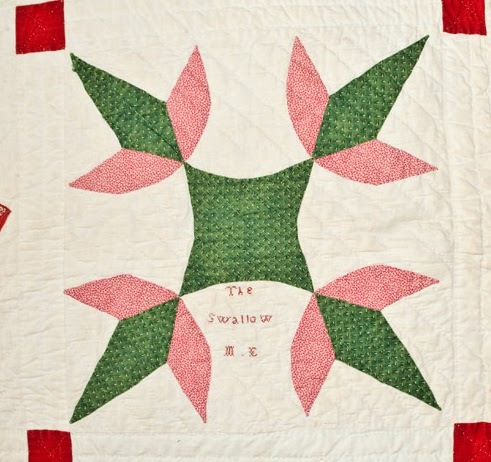 The best evidence that a 19th-century quilt is associated with a name is the name on the quilt. This sampler quilt dated 1862 with names from the Wortendyke family has one block signed "M.E." and the words "The Swallow." I would assume that M.E. knew this popular pattern as The Swallow. as seen here in BlockBase pattern #3099. Other excellent evidence is a pattern name published with a picture in the 19th century. Unfortunately you don't see many patterns with pictures published until the late-1880s, so most earlier names went undocumented. Occasionally you come across a pattern name in a diary or letter that has been passed on with the quilt mentioned, a rare occurrence. I found a reference to the name Flowering Almond in an 1860 letter from Elizabeth Nessly Myer. The family had a quilt similar to the applique above. 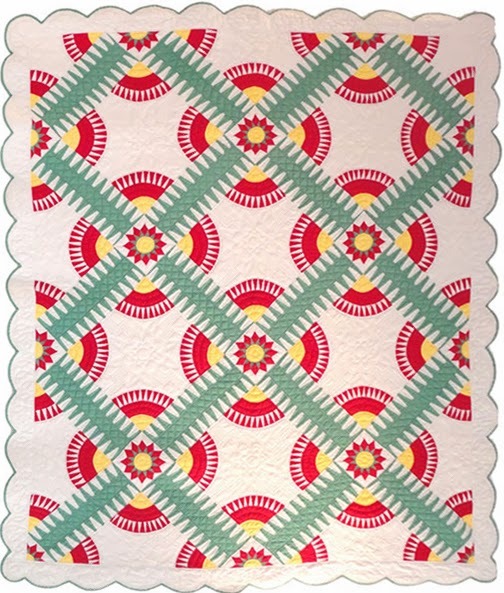 * In the early 20th century Comfort magazine published a similar pattern as Flowering Almond, a name that persisted into the 1980s when Bets Ramsey and Merikay Waldvogel did the research for The Quilts of Tennessee. * Mill Creek Journal, Kay Atwood editor and publisher, Ashland, Oregon, 1987. 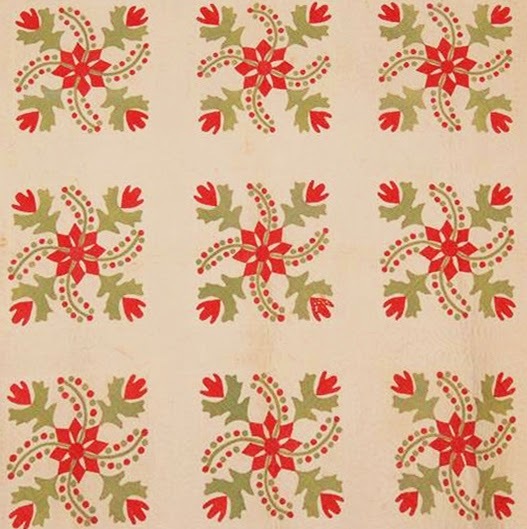 But lacking an image linked to the name, we shall have to remain skeptical whether the quilt in the 1854 diary was the pattern we think of as New York Beauty. The pattern has many vernacular names in the South, commonly "Rocky Mountain Road" or "Crown of Thorns". 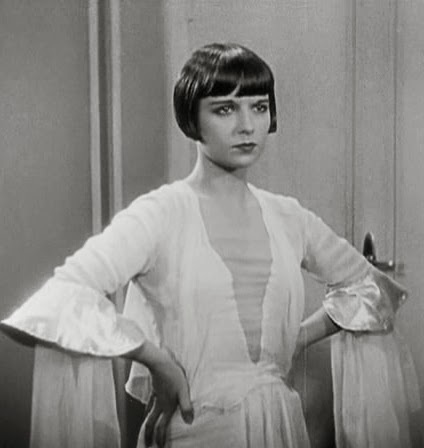 A similar pattern was published and sold by Mountain Mist in 1931 as "New York Beauty", which is today's standard name nationwide. 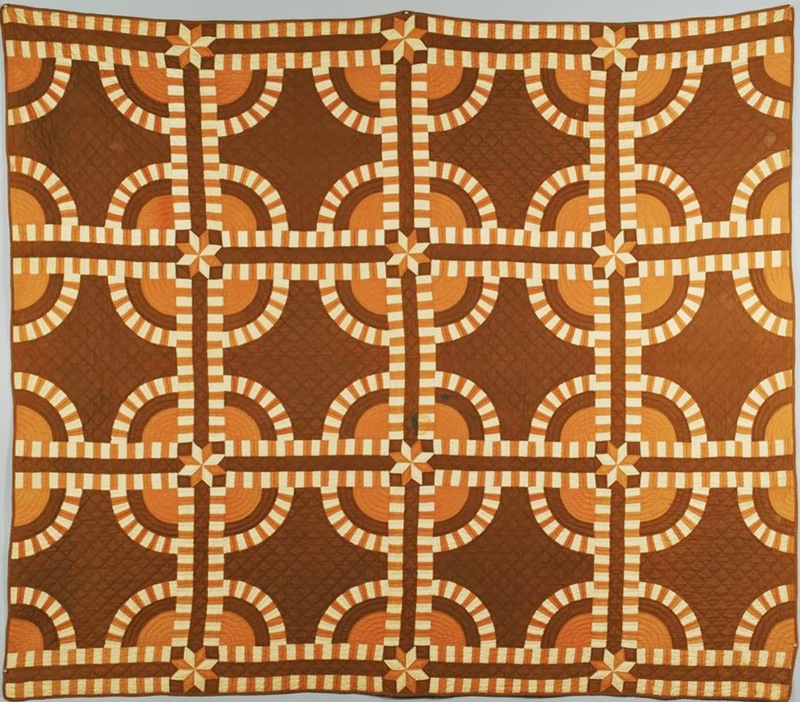 An 1854 diary refers to a "New York Beauty" quilt but whether it is the same design is unknown. Thanks for a couple of thoughtful posts on the tracking of pattern names! Love the info. Such interesting conversation! 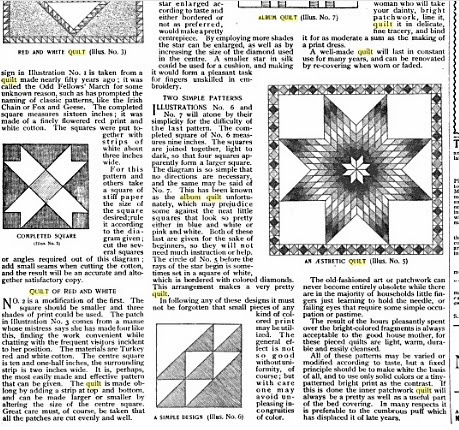 Love the history of the quilt patterns. Love the "rethink" photo!! Interesting that this subject is forever evolving. Thanks for keeping track. 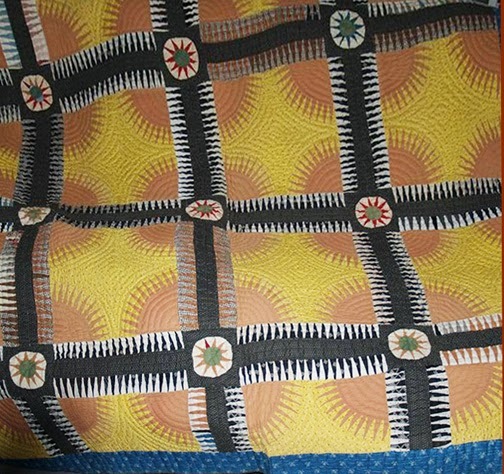 I have a friend who just sent me some pictures of a quilt made by her great, great, great grandmother. It is very simular to the ones pictured in this post. My friend's great aunt passed this quilt to her along with a note detailing the maker and the following info: made during James K. Polk's presidency (1844-1848). 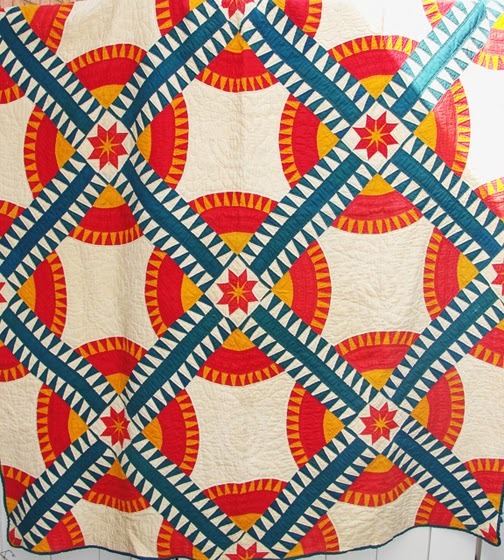 The maker called the quilt, "Polk in the White House" and gave it to her son as a wedding gift. The son was born in 1849 the same year James K. Polk died. 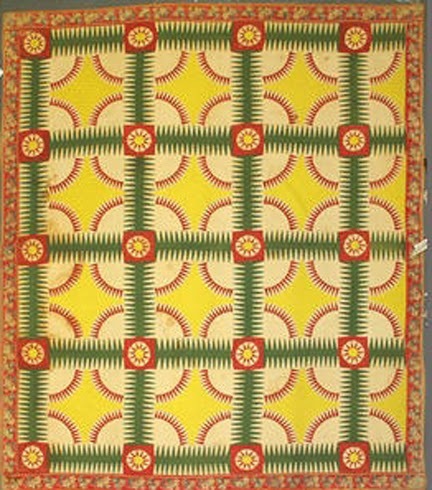 The quilting was done around 1852 or 1853. It was made in Tennessee. Stay tuned for the Spring Issue of the American Quilt Study Group's newsletter "Blanket Statements" for more about this topic. It will be distributed to AQSG members later this month.